Gone are the days when media and communications mainly remained confined to cinema, newspaper and radio-the 70s.In early 80s audio- visual electronic medium in the form of television invaded the Indian scenario in a big way. Nineties was the decade for satellite television and then come the internet era which revolutionized the media by reaching most of the households in India. Thus there is increased demand and many people are choosing career in media and communication. Technological advances continue to affect careers in media and communication, from new printing procedures to multimedia presentations to increased computer use in every area, to digital marketing, social media marketing etc and brought manifold challenges to the professionals working in media and communication. Graduates in any subjects can enter to this profession, but a degree in mass communication at graduate or post graduate level helps to master some skills to have a great start as a media professional. However, it is essential to add more and more skills to progress well and a strong networking skill helps to reach top level. But how to choose from the so many careers in this field? You need to make the right career choice from careers amongst Journalism, advertising, Public relation, Publication, TV, Radio, Film, Photography, copywriting, marketing communication and much more..A good starting point will be to get an assessment of your potential or skills that you possess to see where you stand to lead a successful career in media and communication industry. Media world is full of creativity and full of fun. If you choose to be in the advertising world besides creative satisfaction you will get opportunities to do different things every day; deal with all sorts of clients and all sorts of products. It is a well-paying and well respected field. A career in the film and TV industry offers you an opportunity to be part of the glamour industry. There is no scope for becoming lonely or reaching boredom as you will be working with a massive team of people. You can make a lot of friends and useful contacts. Since you are involved in a creative process, sky is the limit as far as success and money is concerned, but you need to have right kind of potential to reach this kind of success. Working in radio offers you lots of creative work, many personal contacts, and the career satisfaction of becoming widely known. Journalism world is little different. There is never a dull moment. No two days are the same. Some exciting things are going on. In addition there is always a sense of pride ‘being intellectual’ because you are constantly informed on what is going on throughout the world. Information is always at your fingertips. You often know what is going on in the city (or the world) before anyone else. The industry is transparent, your name is attached to anything that you do, so you make a name and fame. A career in public relation can result in a very satisfying career. In this technology era you hardly find jobs that allow your strategies to come to life, to be observed by thousands or even millions of people. Career in publishing is awesome. It offers competitive compensation and generous benefits. You do get access to top authors and top industry talent leading to great career satisfaction. Overall there are many good careers in media and communication and you need to make the right choice based on your strengths. 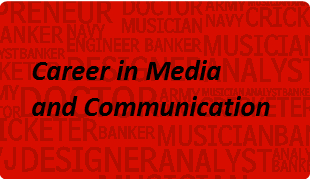 Find out whether media and communication careers suit your strengths!